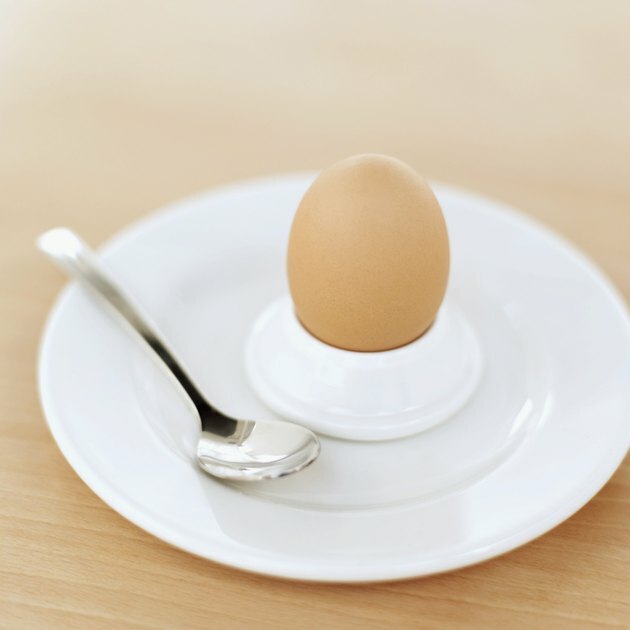 Can Eating 30 Grams of Protein Each Morning Help You Lose Weight? Kristen Fisher is a freelance writer and editor with professional experience in both print and online media. She has published articles on a wide variety of topics including health, fitness, nutrition, home and food, and her work has appeared in "Connections Magazine" and on Lifescript.com. She graduated from the University of Arizona with a degree in psychology. There's truth behind the idea that breakfast is the most important meal of the day. But if you're trying to lose weight, not all breakfasts are created equal. A morning meal that's rich in protein can help you lose weight by keeping you full, satisfied and less likely to overeat. A high-protein breakfast may aid weight loss because of the unique ways that protein affects hunger and appetite. Protein-rich foods take longer to leave the stomach, so they keep you full longer than other foods. Protein also keeps blood-sugar levels steady, which prevents the sudden hunger that occurs after a dramatic drop in blood sugar. You burn more calories eating protein, since the body requires more energy to digest the nutrient than it does fat or carbohydrates, according to the Harvard School of Public Health. Donald Layman, professor emeritus of nutrition at the University of Illinois, recommends consuming at least 30 grams of protein for breakfast. Eating protein all day may help you stay full, but the nutrient is particularly important at breakfast. A study conducted by Heather Leidy, assistant professor at the University of Missouri's Department of Nutrition and Exercise Physiology, found that overweight teens who ate a protein-rich breakfast felt fuller longer and were less hungry throughout the day compared to when they ate a low-protein breakfast or skipped the morning meal altogether. Eating a high-protein breakfast was also associated with a reduced desire to snack among the participants. While eating more protein at breakfast is a smart strategy for losing weight, you still need to pay attention to your calorie intake. No matter how much protein you eat, you won't lose weight if you're still consuming more calories than your body burns. Protein is a powerful weight-loss tool because it can help you reduce your calorie intake without feeling hungry or dissatisfied with your meals. That's why it's important to get most of your protein from lean sources and limit your consumption of fat and calorie-dense protein foods to special occasions. To get your 30 g of protein at breakfast, reach for Greek yogurt, turkey bacon or turkey sausage, reduced-fat cottage cheese and eggs or egg whites. Get creative with eggs by making frittatas, egg sandwiches, burritos with scrambled eggs and black beans, or just hard-boiling a few eggs for mornings when you don't have time to cook a full breakfast. There's no need to stick with traditional breakfast foods. Protein-rich foods like white-meat poultry, fish, cheese, protein shakes, tuna, beans, protein bars, tofu and quinoa can be as satisfying in the morning as they are later in the day. What Are the Benefits of a High-Protein Breakfast?